Lotus Thai has been a favorite lunch spot of mine. I used to work on the west side of town and made it over there frequently. Now, I’m sad to say that I only make it out there once in a while. Service at lunch is usually pleasant, but often a bit understaffed. The quality of the food makes up for the slow service, in my opinion. The dishes are consistently good and the portion sizes are a good value for the $8.96 lunch special that includes a small salad and a Thai spring roll with the entree. My favorite dish is the cashew chicken. 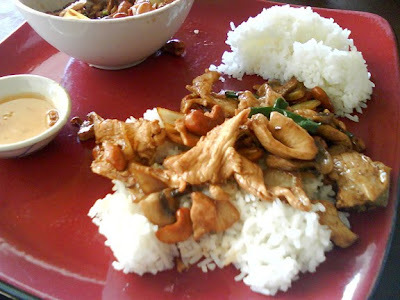 The cashews are always very fresh and nicely toasted and I haven’t found another Thai restaurant in the area that has a better sauce for the cashew chicken. The portion sizes are generous and I can get two lunches out of one order, but because their spice level can be a bit hit-or-miss I usually order in between mild and medium for leftovers so it doesn’t get overly spicy the next day. The spring roll is always perfectly crisp and delicious and the simple honey sauce is a nice compliment. The dressing on the salad is a little sweet, but still a nice addition to the meal. The designer and artist in me loves the intimate and cozy upscale Asian decor and that the plates the meals are served on are beautiful and seem to change with every visit. It’s just an added touch that makes the experience a bit more special.